Discussion in 'North American Politics' started by Kangaroo Feathers, Apr 4, 2019. And the title of the thread is excellent. We can change topics almost every day. So, taking all bets, how are the Trumpettes gunna spin this one? My money is on "ignore that he said it, ignore anyone mentioning it, and hope everyone forgets about it". What studies did Mr Trump cite? Surely his assertion's generated questions. By "windmill" did he mean wind turbines? And his father was born in Germany except for the lying birth certificate and the fake news media who keep insisting that he was not. LOCK THEM UP (of course). Hey!! Save something for tomorrow. EDIT: Oops, for some posters (the OP for example) it already is tomorrow. "Tim Apple. Oranges. German Dad. Mental Health Experts Warn That Trump Is Losing It. Some say that the president’s language and behavior suggest cognitive decline, possibly associated with pre-dementia. President Donald Trump’s recent confusion with words and facts, including about his own father, could be signs of pre-dementia and deteriorating cognitive skills, mental health experts warn. On Tuesday night, [4/2/2019] during his speech at the National Republican Congressional Committee spring dinner, Trump, who was then in the middle of 90 minutes of rambling remarks, veered off on a two-minute, 22-second detour that touched on how wind turbines kill bald eagles and other birds, moved on to how North Korean dictator Kim Jong Un was not ready for a deal, came back to how people who use wind power can’t watch television if the wind doesn’t blow, and finished with former President Barack Obama playing golf in Hawaii:"
Then, of course, there's Trump's latest obsession. "But where does the president's public opposition to wind energy stem from? Could it be personal? Of course it is. When doesn't a Trump position on an issue not come down to a matter of personal interest. I would feel ashamed that we have such an idiot for a President, but I didn't vote for him, so my conscience is clear. I hadn't even heard about his father's birth place being retconned, but honestly, there's so many instances, who can keep up? "But where does the president's public opposition to wind energy stem from? This thread may have new entries being added well after he leaves office. It actually is unethical to diagnose someone who isn't your patient/client. Of course I get what you're saying, and I agree it will happen, but this fascination with applying diagnoses to people needs to be nipped in the bud because ultimately such attempts are highly speculative and missing so many pieces of the puzzle that a proper diagnosis can't be reached. Even with seemingly simple things, there are potentially other things going on that better explain behaviors, but we can't see or know them because we aren't there to take tests, provide assessments, or ask questions, and then of course many ailments have very similar symptoms and even doctors can have a hard time telling them apart. If you actually watch the video it is clear this is a straw man attack. President Trump doesn’t of himself say wind mills cause cancer. He said house prices near wind turbines drop 75%. He gives a reason for the drop. It is because “they” say it causes cancer. He isn’t saying windmills cause cancer. He is mocking those people do say that. Here we have yet another example of Trump haters trying to create a straw man out of whole cloth. Misleading title. 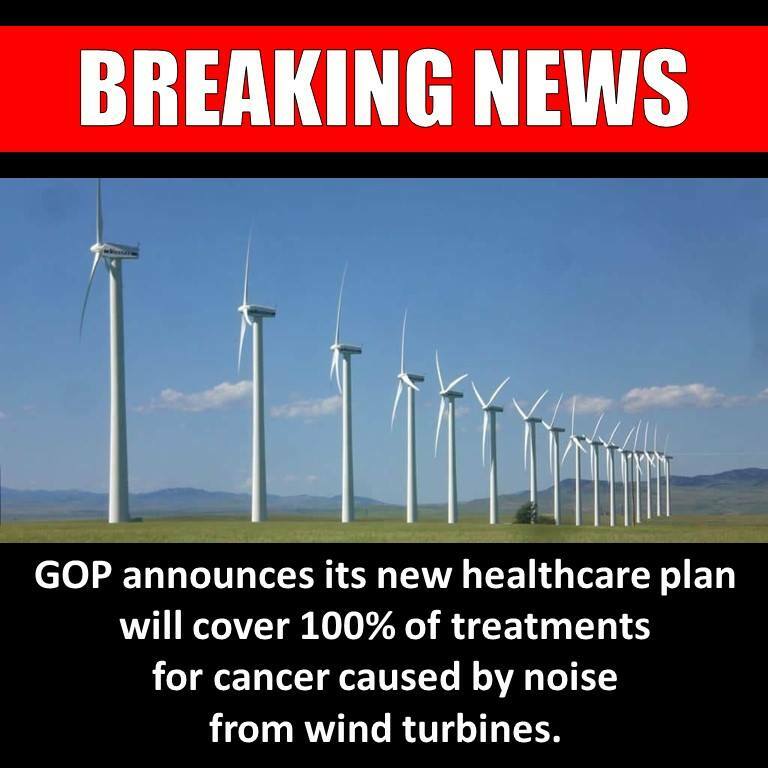 President Trump did not say wind mills cause cancer. He said other people (“they”) say that. 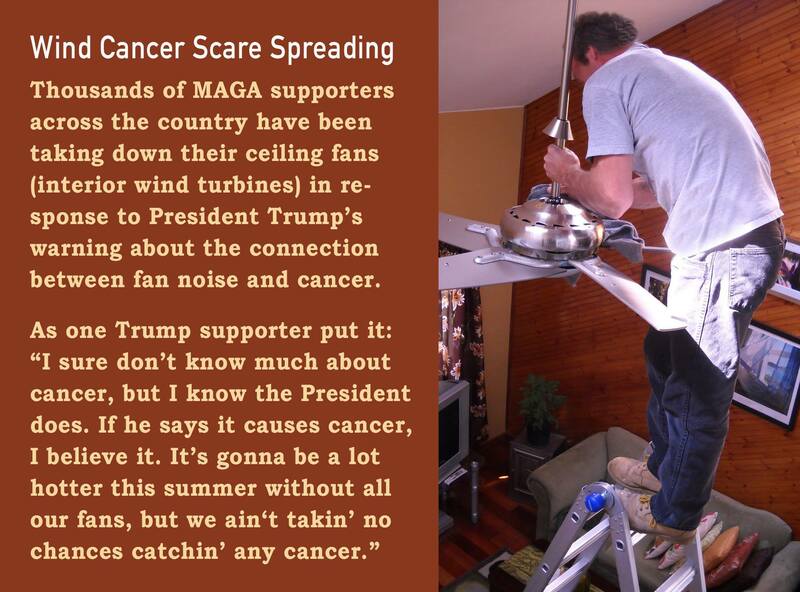 With spin like that, you're in danger of windmill cancer yourself! No one says it. "They" or otherwise. Trump is a buffoon either way, so take your pick. President Trump says “they” said it, not him. Unless you know everything that everyone ever told him, something you ineluctably can not know, your statement that “no one says it” is nonsense. And Trump is a buffoon for saying so. There is no "they". But believe what you must to maintain your tissue. President Trump never for himself said that windmills cause cancer. Sorry that pours cold water over your “fun” of attempting to mock him for something he actually did not say. Too bad for you. But if you persist in trying to mock him for saying something he actually didn’t say, that only makes you look foolish. And to continue to claim he said something when you have been provided with evidence he did not is to lie. That is often an effective technique to use when a belief is one's own crazy belief. No one makes that idiotic claim except for Trump. By lying and using the phrase "they say" he gives himself plausible deniability with the Kool And drinkers.